The artists' colony outside Moscow where Boris Pasternak and Kornei Chukovsky spent their summers writing, still seems like a place out of a novel. 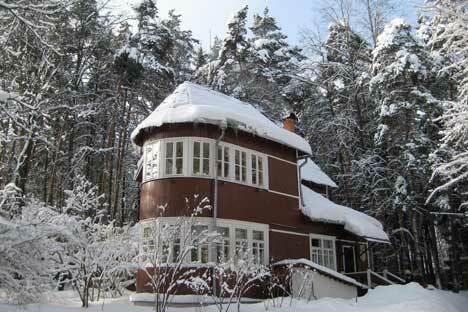 Just a twenty-minute train ride from Moscow, is a cluster of literary dachas, including the house where Boris Pasternak wrote Dr. Zhivago. The writers’ village of Peredelkino – still under deep snow at this time of year - is a magical place in the winter-spring, despite the new developments and busy roads that threaten to erode its peace. Number 3 Ulitsa Pavlenko is the Boris Pasternak house-museum. It is open 10-4, Thursday to Sunday and entry costs 100 rubles (about $3). The interior of the white-trimmed brown dacha, jutting into its snowy garden like the prow of a boat, is markedly austere. In the bare bedroom and study are his boots, coat and hat, just where he left them. The beautifully light conservatory, laid out with samovar and cups, looks out onto the overgrown orchard. Among the icicle-hung dachas and snow-bowed fruit trees near Michurinets Station, is the wonderfully cluttered memorial dacha of the bard-poet Bulat Okudzhava (open 11-4 Thursday to Sunday). Okudzhava is best known to most foreigners in Moscow from a slouching bronze statue outside the Moo Moo cafe on Stary Arbat and for his famous songs about Arbat and the Moscow Trolleybus. Tours of the museum (slightly pricey at 300 rubles) include a moving video about Okudzhava’s life and work with renditions of several of best-loved haunting ballads. In the tiny study, you can see his collection of little bells with more of them hanging from the ceiling of the exhibition hall. The memorial house-museum of Russia's best-loved children's author, Kornei Chukovsky, is just around the corner on Ulitsa Seraphimovicha. Chukovsky’s fairy tale poems, with their strong rhythms and playful rhymes are perfect for people trying to learn Russian. The friendly guides in the museum can tell you stories about Chukovsky’s impoverished early life, when he worked as a roof painter while simultaneously teaching himself English. He went on to become one of Russia’s most celebrated translators; in his eighties, Oxford awarded him an honorary degree and the academic gown hangs on his study door. In the library, there is a portrait of Chukovsky, which was painted by the radical poet Vladimir Mayakovsky using a cigarette dipped in black ink. The museum is open 10-5 Wednesday through Sunday and costs 100 rubles. A “wonder tree” in the garden covered in shoes, a motif from one of Chukovsky's verse-tales, sets the tone; behind the house is a small forest path leading to a stage and campfire site for visiting school groups and next door is a children's library. The fence opposite has panels painted by children, illustrating Chukovsky's stories. Peredelkino still has a few famous inhabitants, but these days money and status are more essential than literary talent. On Ulitsa Lermontova, visitors pass the red brick wall of a mansion belonging to the sculptor and artist Zurab Tsereteli, who was responsible for a giant, controversial statue of Peter the great in the Moscow River. A huge bear and a mosiac structure are visible over the fence of Tsereteli’s dacha. The ornate buildings near the cemetery gates, close to Peredelkino station, are the summer residence of the Russian Orthodox patriarch and include a colorful chapel and Russian revival-style turrets. Just beyond is the lovely old Transfiguration church, which used to be visible from Pasternak’s window, in a disused orchard, full of goats and wild lupins in the summer. Pasternak's white, pine-shaded gravestone is near the top of the cemetery and nearly always has flowers on it, left by poetic pilgrims. Visitors can reach Peredelkino on the local train from Moscow’s Kievsky Station. A return ticket on the train costs just 52 rubles ($2) and vendors and buskers often enliven the journey. The “Dyeti Solntsa” restaurant, along a driveway to the right off Ulitsa Pogodina, is inside the old Dom Tvorchestva (“House of Creativity”), dating from the 1930s. Decor and prices reflect the aspirations of the prospective clientele; if your budget won't stretch to it, there is a cheaper café and a couple of shops near Peredelkino station.